Why design & discovery necessary to build your Mobile App RFP? It is essential to understand the key aspects of design and discovery before choosing the mobile app development partner which is surrounded by the vision of your mobile app project because these aspects also include your business objectives, proposed timelines, and budget. So, the best way to share project details is with potential vendors. Drawing out an in-depth request for proposal (RFP) will help you and your team to evaluate vendor responses and choose the best partner of your mobile app project. Nowadays, itâ&#x20AC;&#x2122;s common for vendor sourcing to submit their incomplete request for proposal which lack details and fail to acknowledge the entire project scope. Eventually, if an RFP poses for more questions than it answers, then your company runs the risk of receiving low offers from vendors who promise to deliver on budget, but as additional work which wasnâ&#x20AC;&#x2122;t initially covered in the RFP arise, present higher costs where it is also possible that some vendors may decide not to bid at all. So, here in this scenario design and discovery session can help. It not only allows companies to learn about the business and markets but also helps to develop a clear concept and plan for their product. Gaining knowledge and insight which is provided during the design and discovery will ultimately help in getting to lead more detailed RFP, which will also help for a higher probability of your company to find the vendor which suits your project. 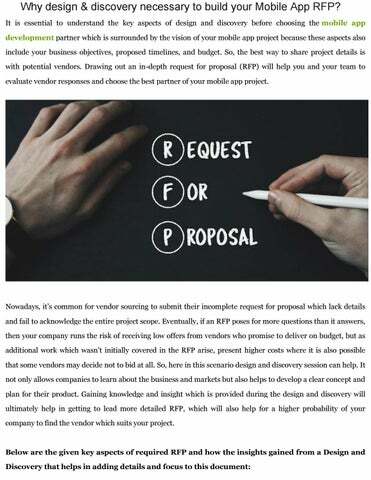 Request for proposal (RFP) helps to communicate the product requirement because if vendors misunderstand, then they may not be able to fulfill the requirements. So, it is essential to communicate what you precisely need so that your development partner can accurately interpret your goals and expectations. The more details you give, more you will be getting proposals’ which will convey the extent of your vendor’s capabilities such as accurate timeline and price estimations. Therefore, if you want to write the best possible RFP, you must have the clear understanding of what you want to develop and what you can accomplish within your proposed timeline along with full extent services covered by your budget. Because, It can create issues down the line, if you write any RFP without prior accurate information. Outcomes from Design & Discovery Design and Discovery stage of a project enables you to establish the goals for your mobile application development. It also helps you to understand the business outcomes which you aim to achieve. Therefore, this phase consist of four key areas of product delivery such as product strategy, product definition, product visualization, and product presentation, which also help you to write all the information which are needed to write an explicit and transparent mobile app RFP. It also gives you a chance to talk to development experts and can ask questions to clarify your RFP. So, during this process, you can even discuss the full breadth of your required service. How to Use Design and Discovery for Writing a Mobile App RFP Once you completed with collecting the information, then you need to translate the data into an RFP. Given way to apply key information for adding details to the document helps to understand your business objectives and what you aim to accomplish with this product development or where you fit into a particular market. Therefore, detailed market research is conducted during the design and discovery of your business and competitors. 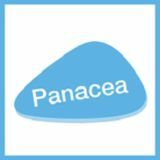 It also helps vendors to develop the product according to the market. So, knowing your market will let you make an essential decision on choosing the right platforms for releasing your project because platform choice has a direct impact on key RFP elements like timeline and budget. So, given points will help you to define user experience deliverables, clarify your ideas and provide a better understanding of your target audience’ of how they will interact with your mobile app. Henceforth, this given information will also help you to thoroughly define the functionality of your product as well as the project scope. So, for wrapping up mobile app request for proposal is necessary for your iOS and android app development project. So, by providing exact details RFP will help you in getting proposals, which convey the extent vendorâ&#x20AC;&#x2122;s capabilities.